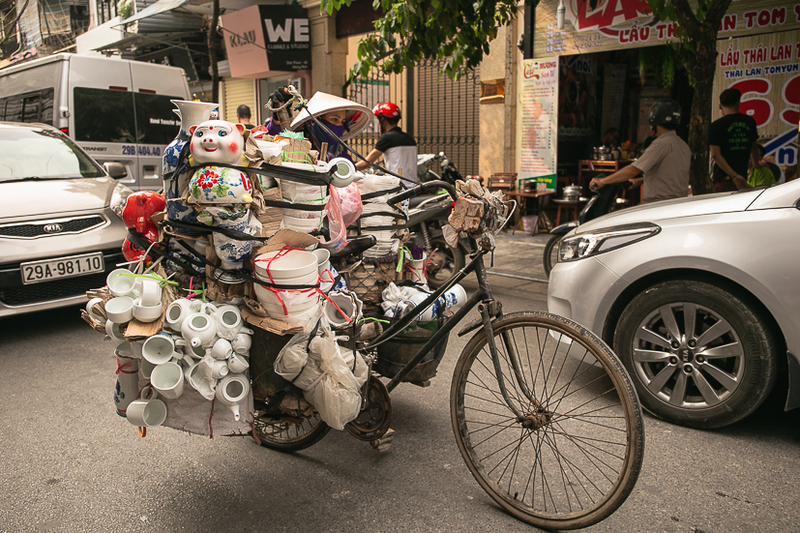 An Italian living in London is captivated by large scale conjuring tricks characteristic of daily life on Hanoi streets. 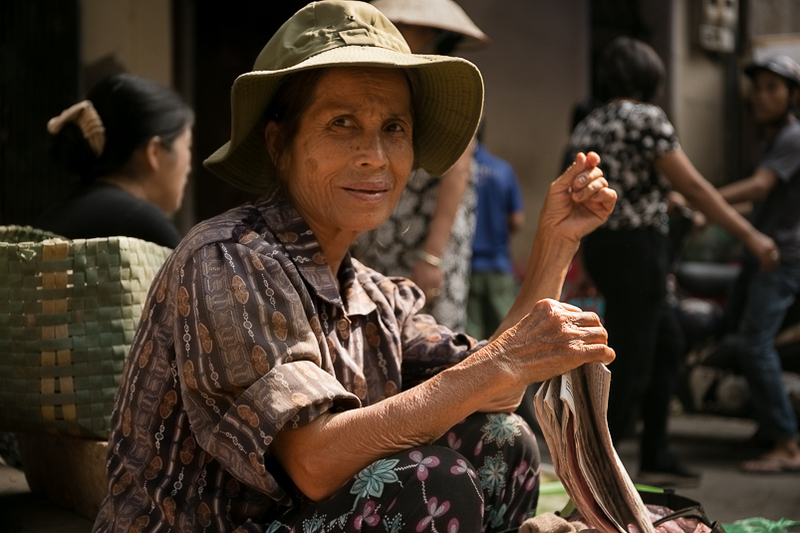 Feat of arms: A woman selling ceramic items on a Hanoi street. As if I needed a second warning, the driver prepares me for Hanoi’s traffic. We are proceeding from the airport to the city center, and he gleefully informs me: "We have around 8 million people in Hanoi and 5 million motorbikes." It’s a bit dark and very humid. As the car cruises through the city's streets, a lot of motorbikes, some carrying big objects, animals or an entire family, pass us. Many show awareness of how bad the air can get. Even on the streets, people are wearing surgical masks. The traffic is fast and there is a lot of honking, a lot of which I feel is not needed. It’s irritating, but the honkers are oblivious to it, of course. No matter what you’ve heard earlier, actually seeing pedestrians cross streets with no apparent rules is incredible, not to mention scary. The modus operandi seems to be simple: Just walk slowly without stopping and the vehicles will avoid you. It just happens that way. Better if you cross in the slipstream of other pedestrians, though. 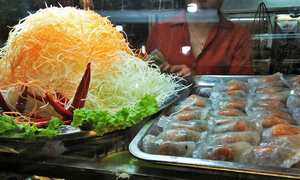 Hanoi never ceases to surprise and amaze, especially you are a foreigner visiting the place for the first time. Once you accept the traffic chaos, you can really tuck into the street food, amazed at how many people cook on the street. 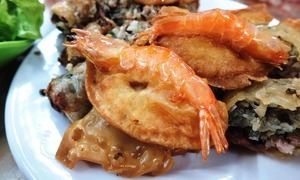 The BBQ dishes are a must and the aroma of food pervades the packed narrow streets in the Old Quarter. People sit at small tables with small plastic chairs, all of different colors, in a scattered manner. It’s not easy making your way through the spaces between the tables, with mopeds and motorbikes honking behind you all the while. The Old Quarter is a constantly spinning carousel of food. The streets are full of people in the morning and at night. In the evening, the streets become an extensive street food market, always very busy with locals and tourists out to enjoy a bowl of hot pho or partake of any number of delicious creations on offer. And as you take in this scene, something magical happens. The police arrive suddenly, to inspect unauthorized stalls at the illegal street market, where traders sell everything. These markets are known also as "frog markets", because of the way the vendors jump and run when they see the police coming. I was there during an evening when they arrived, walking in the middle of the street. If they found a table serving food to tourists, the entire merchandise would be seized. A strident scream from one end of the road issues a warning, and as the police make their measured way down the street, waiters run to the little tables and take them away from the tourists savoring boiled hen’s feet with a spicy sauce. Seeing the stunned faces of the tourists is a priceless experience. 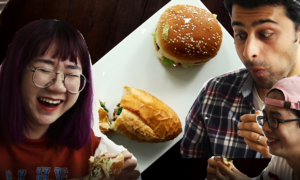 They just look at each other and look around and start laughing. When the police leave the street, in the same measured manner as they came, the waiters return with the exact table and exact plate that the tourists were enjoying earlier. Everything happens in minutes. In minutes everything is back to normal and you can continue to navigate the maze of tables. It is like nothing ever happened. Did I just dream it? 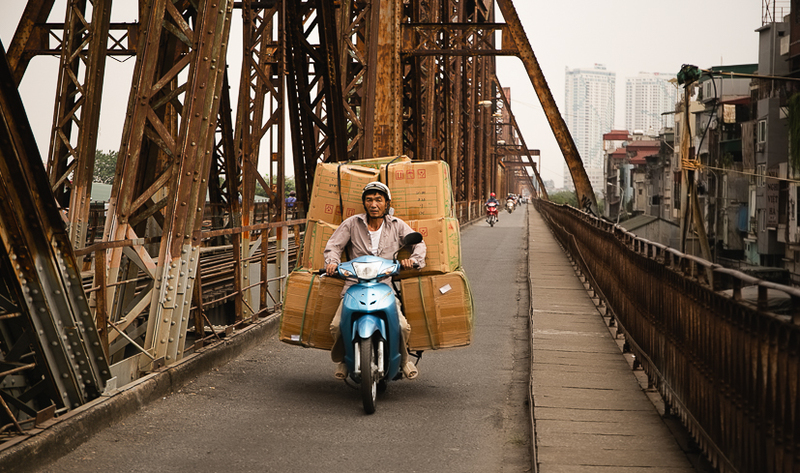 Well packed: A man carries several large cartons on the back of his motorbike on the historic Long Bien Bridge. The Red River passes through the city and several bridges span it. The oldest, the Long Bien Bridge, was designed by Gustave Eiffel (completed in 1902) and links the city with the Hai Phong harbor. Strategically, it has been the most important bridge for the city. In the past, it was heavily bombed because of its strategic importance, and has had to be rebuilt several times, with almost the same style and materials. Today, it’s still in use as a railway bridge and only bikes or mopeds can cross it. You can cross it on foot but you have to walk on the sidewalk made with tiles that shake when you pass over and there are between them, through which you can see down to the street and cars passing under the bridge. After a few faltering steps, I decided that prudence was the better part of valor. 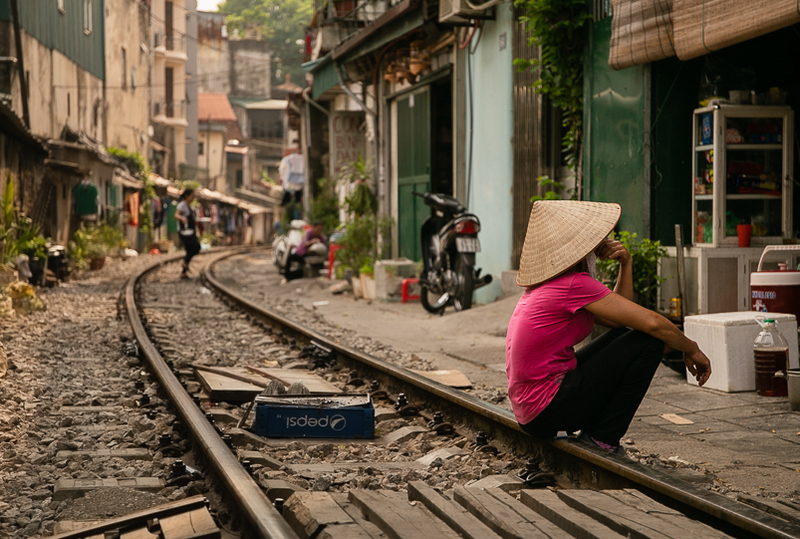 Close comfort: The railway track on Hanoi's Train Street is used as a stool. Following the railway to the western part of the city, one passes through the Train Street, where, at least twice a day, the train passes apparently through the front porches of houses that stand on either side. This has become a major tourist attraction because there is nothing like this anywhere in the world. I stayed in Hanoi for a few days after first visiting Mai Chau, Gam Coc and the Bai Tu Long Bay, each destination offering unique landscapes. And before visiting Vietnam, my first country in Asia, I had been to New York, Cuba, Morocco, Greece, Spain, France and Portugal. All these places have been different, and I am not talking about landscapes all the time. Each time I go to a new place, I try to see it with virgin eyes, like a newborn, without preconceptions. This helps me understand a bit better the personality of a new place, one that I’d known only through books or some documentary. 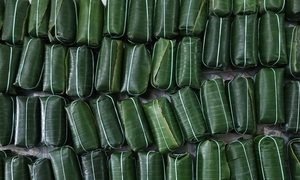 I decided to begin my Asian journey with northern Vietnam because I’d already felt the place was magical with all the mountains, the rice fields, the fog, the city traffic, and, very, very importantly, the food – my favorite cuisine after Italian food. Friendly face: A vendor at a wet market in Hanoi. After actually getting there, I can say this: In Vietnam, the people are extraordinarily friendly and curious. I will never forget the conversations I had using google translator when I had no guide with me. The slalom crossing of the road between moving motorbikes, the women on an Old Quarter street approaching me for a photo that they enjoyed so much seeing on the small screen of my camera, laughing and requesting another portrait, young people asking me questions about my country, saying they want to improve their English skills, the restaurants that disappear and reappear in a trice – these are experiences and scenes that will remain etched in memory forever. 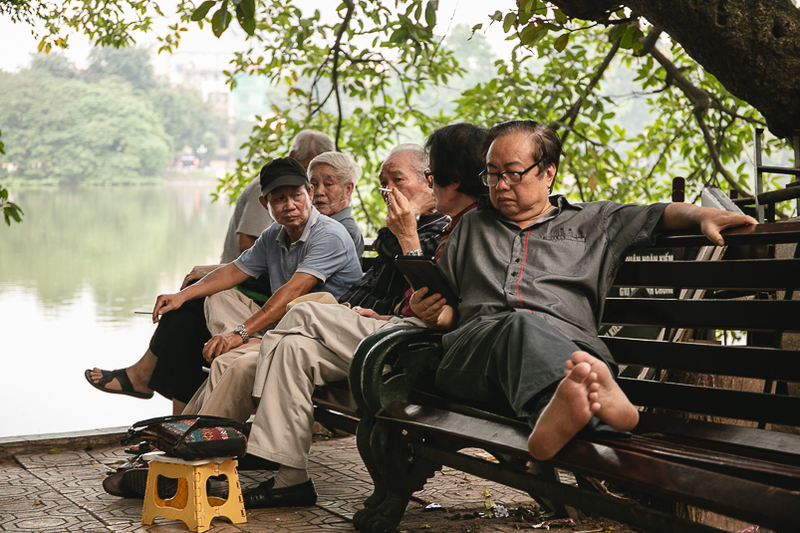 Laidback: Senior citizens relax on the banks of Ho Guom, or the Sword Lake, an iconic landmark in Hanoi. 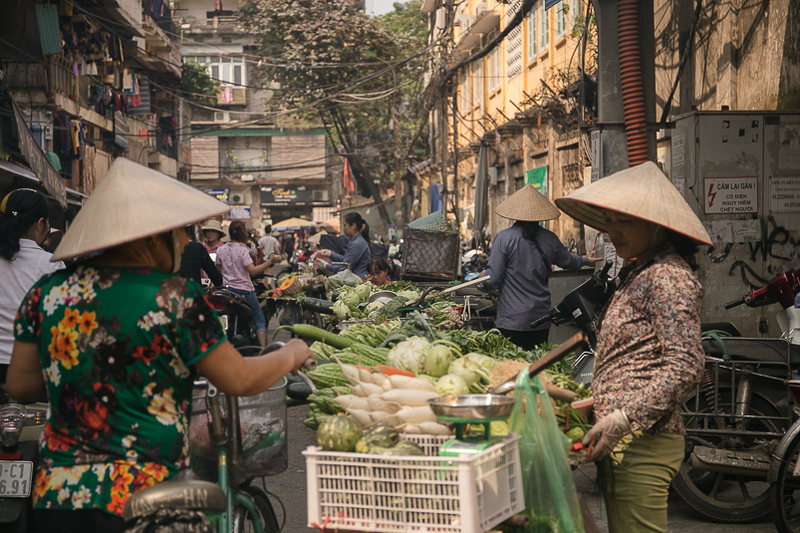 Fresh and green: A street side market for vegetables in Hanoi. 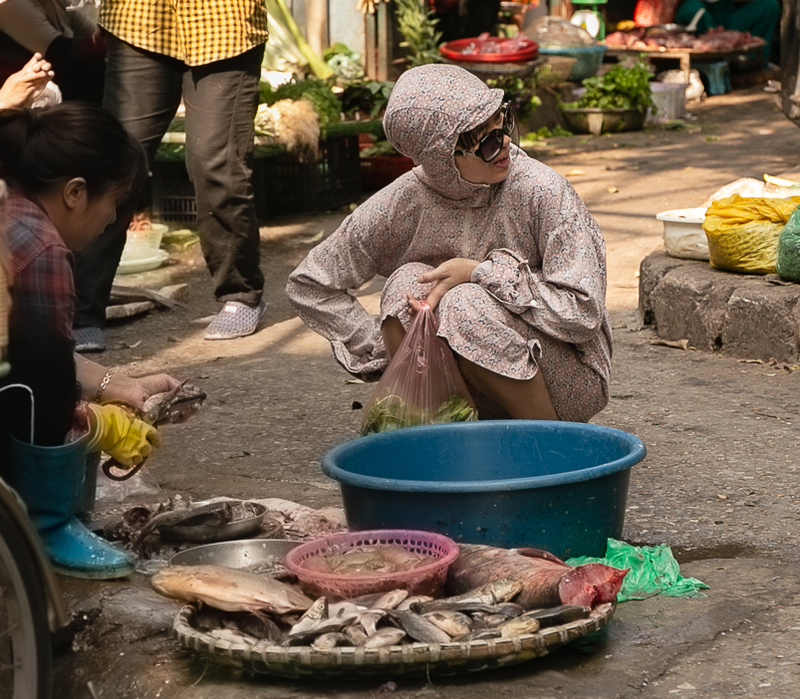 A super market: A woman wearing a cotton overcoat to avoid sunburn buys fresh fish at a wet market in Hanoi.